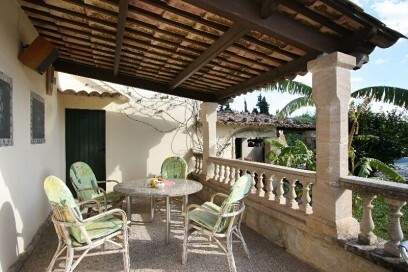 DOWN IN PRICE FROM 780.000 EUROS TO 680.000 EUROS! Beautifully located country home in walking distance to Pollensa village with 3 bedrooms, two bathrooms, living_dining room with chimney, a new kitchen, different storage rooms and an outside bathroom with the large swimming pool area with covered BBQ terrace (with suckling pig oven). The house has oil central heating and its water own well (with filter). The pool is of a good size. The whole plot is totally private, fenced off with a wall and plants. There are a plethora of fruit trees... lemons, oranges, grapes, figs etc, (all with automatic sprinkling system!!). The house itself offers approx. 133m2, plus 54m2 of covered terrace and a swimming pool of 66 m2, a garage of 24m2. Many possibilities, 4th bedroom suite can be had when sauna room not wanted! This stunning property is situated on the hillside in the sought after La Font area of Pollensa and consists of a spacious lounge/diner, a large, modern fitted kitchen, a laundry area, pool room, many covered and sunny exterior terraces plus 4 suites each with it's own terrace and a double garage with automatic doors plus parking for 5 cars.Get the full property details.